Last weekend I was working in the garden when a neighbor walked by and asked a question about a particular plant. This plant wasn't in my yard, it was down the street a bit, in a newly landscaped yard of another neighbor. So I walked down with her and we looked at this new landscaping and identified some plants. The particular plant this particular neighbor was interested in was Kangaroo Paws, which is an interesting and wise choice for drier California gardens. As we stood there in this other yard chatting, I mentioned that they way the landscaping had been planted was displeasing to me. It's a vast expanse of lawn with a border of these kangaroo paws and other more common plants, all planted about four feet apart from each other. The ground in between the plants is mulched with wood chips (and that's great!) but the plants are so far away from each other. I said that I preferred a riot of plants, all close together, making a kaleidoscope of color and texture; some high and waving in the breeze, some low to provide a living carpet mulch. I waxed poetic about that type of planting until I looked at this neighbor next to me, who had a sort of blank look on her face. So I stopped talking and she said, "actually, I'm the opposite. I prefer plants to have lots of blank space around them, so you can appreciate each blossom." Well, that was interesting. I had never considered that there were people who preferred that type of planting, something I've always read about and thought of as 'polka dots.' I then remembered another neighbor who once looked at my front woodland border and said, "I prefer things neat." It's fascinating, isn't it, the way we each have our certain ways of doing things, and the way our eyes see beauty? 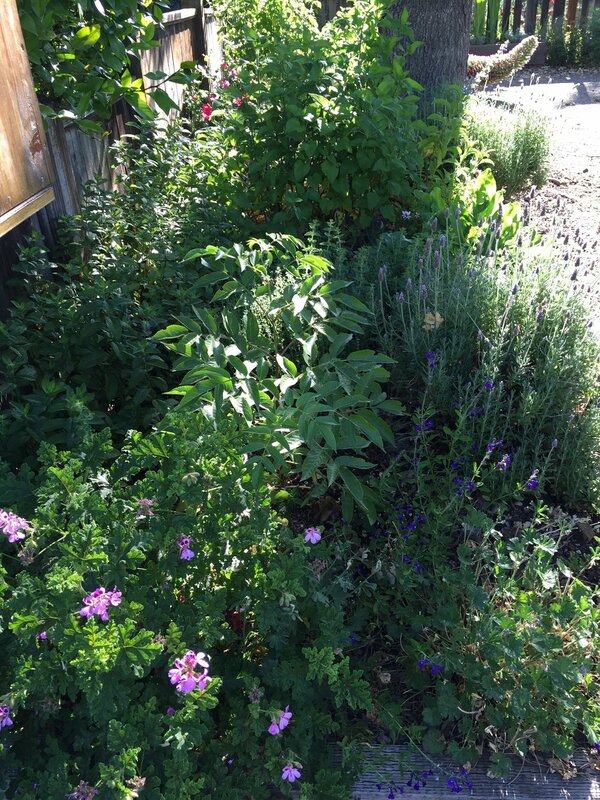 I don't think of myself as a messy gardener; after all, we have a strict pattern of raised beds all over our yard, each of which has a neat, defined border of wood, and plants growing within that border. In spite of that, or perhaps even because of it, I like my borders to be a bit wild. The interior spaces are dedicated to production - food for our family. Therefore they must be organized and neat. But the borders can be a tumultuous array of natives, ornamentals, perennials, and annuals, all growing in a haphazard manner and lending the garden a sense of the carefree. I'm not knocking my neighbor's preferences for orderly spaces, but there is some science behind letting your flower beds, and indeed even your vegetable beds, be a little bit on the overgrown side. Let's go through those reasons one by one. 1) These wild borders mimic natural spaces. Where in nature do you see a neat, orderly, polka-dotted landscape? Nature fills in space, with whatever it needs in that place to improve the soil for the next plant. Soil life depends on living roots in the ground for optimum health. Living plants are constantly feeding the microbes in the soil and making important exchanges to improve both the soil and the life of the plant. Dying foliage offers nutrition to the area. Conversely, orderly landscapes show only the asserted will of humans. I'm not sure when the trend of orderly landscapes started, probably a long time ago in Europe and Asia, when humans decided they could improve nature, and started manipulating plants. I'm not saying there is anything wrong with asserting a human force of will on your garden. But I'm saying that, while it might be enjoyable to the gardener, it may not be what nature intended. I would say mowed lawns fall into this category. Where in nature do you see a lawn? Now a meadow, maybe. 2) Pollinators like drifts of flowers. You'll attract more butterflies and bees if you plant drifts of flowers, all close together. Pollinators like a place where they can go and stay awhile. If your plants are few and far between, they may just skip the joint all together - it's too much work for too little reward. If you like seeing beautiful wildlife (birds too) in your garden, and if you like having your food plants pollinated, plant more closely and in drifts. 3) A plethora of plants helps shade the soil and conserve water. Here in our dry state of California, choosing plants by water needs is a good way to go. If you plan your border to reflect a particular plant community rather than 'native' or 'imported,' you can have lots of flowers that you enjoy that may not be particularly suited to our state. Natives are important and I try to keep the contents of my borders 50% native; but you don't have to limit yourself to those as long as you put plants in similar communities and water needs. Plus, if you have lots of plants, you'll actually conserve water. This is because the plants form a canopy that shades the soil and allows less water to evaporate from the ground. A moister soil also helps regulate the temperature under that canopy, so that the plants don't get too dried out. It's a win-win. 4) A dense canopy of plants also helps to crowd out weeds. If every space is taken by a plant you intended to be there, there will be no room for weeds. 5) You'll attract beneficial insects. Not just the pollinators that we all know and love, but also weird creatures that like to shelter in a denser canopy. These weird creatures are often the good guys, eating up the aphids and thrips and whiteflies that plague our crops. We all have plenty of prey insects, regardless of whether we want them. The trick is to invite the predators in too. And one great way to do that is to plant a full and diverse border. 6) And that brings me to the subject of diversity. When you plant a diverse grouping of plants, you're solving lots of problems at one go. You'll get some plants that have shallow roots, some that have deep. You'll get some lower growers and some tall growers. You'll get some flowers with daisy-like heads and some with umbrella-like heads. You'll get some who have lots of pollen and some who have lots of nectar. You'll get a gorgeous flower show from the entire rainbow, as well as different greens from the leaves, which create texture. You'll get big leaves and small leaves, coarse foliage and fine foliage. In other words, it's a delight for your eye, for the insects, and for the soil. 7) Plants grow better with friends. As long as you are careful to plant in correct communities (things that like acid soil, things that like clay soil, things that like shade, things that like dappled sun, etc), plants will do better with a diverse community around them. Permaculture has the right idea about this with their guilds. 8) Perhaps the best reason of all, it's less work for you as a gardener. Why are you spending time mowing and chopping and weeding and watering and cleaning up all the time? And you can do this in containers, too, if you don't have yard space. My mother, who lives on a rocky hill that has remained (sensibly) a native habitat, has hundreds of pots on her deck which are always awash in color and beauty. I don't mean to imply that having this kind of garden is no work at all. I do spend a lot of time on these borders. First of all, they take years to establish, depending on the kind of plants you purchase. The full look that I've gotten (and love) has taken me all my 13 years at this house to achieve, and there's plenty of spots where I have yet to achieve it. It takes planning, time, and money at the outset. And the ongoing maintenance also is an issue if you choose more annuals over perennials. I like to have about half of each, so that means some seasonal work to replace the spring annuals with summer annuals, for instance. Some clean up is necessary and some re-seeding. And if you put out seeds frequently, you'll need to clear a little space for those seeds so that they have room to germinate, and you'll need to water a little more frequently. So it's not work-free! But the constant 'taming back of nature' isn't part of that. Instead, your goal is to allow nature to take over and do the work for you. So, for my part, I shall leave the heavily tended, cultivated polka-dot look to my neighbors. Instead I will continue to crowd my space with diversity and beauty, and reap all the rewards of it. I believe that, once you understand the reasons to do it this way, you'll want that too.